George Brown Theatre delivers a stylish and thoroughly enchanting production of Bertolt Brecht’s classic of epic theatre, The Caucasian Chalk Circle—a parable of precarious justice, greed and selflessness. It tells the story of a peasant girl who rescues an abandoned baby from a recently overthrown rich governor and his wife. Brecht draws our attention to the mechanics of theatrical presentation—costumes, sets, props—and the dynamic between audience and performer. Rather than simply breaking that fourth wall, Brecht demands that all walls be boldly acknowledged as constructs. In true Brechtian fashion, the actors interact directly with audience members as they arrive to take their seats. We see them prepare the stage area and, just as we get comfortable with the casual atmosphere, an intense fight suddenly breaks out, thrusting us into the opening prologue. We begin by establishing the framing device of a play within a play. This opening was originally set in the Soviet Union after the second world war, with two communes fighting over a plot of developing land, but here we are introduced to a more local area—the Don Valley and Brickworks—just after a societal collapse. This lends a certain familiarity to the politically charged and didactic aspects of the story. Brecht constantly reminds you that the play is artificial, that it has been crafted to excite and provoke you, and so his work risks pushing you so far away you can’t properly invest in the characters. Here is where endearing performances and Richard Greenblatt’s dynamic direction make all the difference. Spectacle and showmanship are essential to Brecht and are in abundance here. With constant use of mulit-purpose props and simple scenic elements, there is a sense of horseplay and dress-up that sells the highly-contrived aspects of the story by making it all fun and celebratory. The inventive stagecraft takes us smoothly from hilarious farce to haunting moments of suffering. The communal atmosphere fostered by the cast feels honest and organic. While they work together to create the people and places of the story, through intentionally silly and cartoonish means, there is a genuine affection for each other and the audience that feels like a cosy blanket we’re all snuggled inside. We care because we sense we’re all in it together. Brecht is, essentially, musical theatre and productions are free to set his lyrics to an original score. John Millard’s music sounds classic and is deliciously catchy, capturing both the silly playfulness and sombre gravitas as required by the text. As Grusha, the brave and resourceful mother who risks much to protect and raise the rescued child, Tal Katz is feisty and viscerally embodies the traits of self-sacrifice and devotion that define the character. As the lover she must leave behind, Duncan Gibson-Lockhart is charming and heartbreaking in equal measure. The second half of the play takes a lot of time setting up a drunken scribe, Azdak, who is appointed as the village judge. We get a lot of exposition here regarding the political situation in the village after the coup that set the plot in motion. While I found my attention wandering quite a bit during much of this set-up, I was able to latch onto Mackenzie Kelly’s astonishingly kenetic and complex portrayal of Azdak. Alison Beckwith, as the Singer (our narrator), is a commanding presence. With her elegant and playful voice, she leads the way for this high-spirited cast of twenty-four. The ending, where Grusha must prove she is the rightful mother of the stolen child, is a perfectly orchestrated final showdown designed to impart the play’s blatant yet exhilarating wisdom. Despite being didactic, this finale is delightfully uplifting. Brecht isn’t subtle, but not everything has to be. With the world as torn and terrifying as it is, there is much needed comfort to be found in a moral argument expressed persuasively. 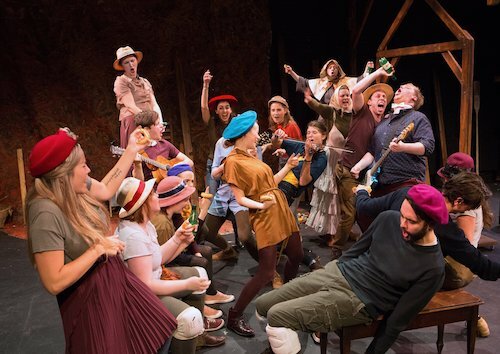 The Caucasian Chalk Circle is a grand and glorious experience. The Caucasian Chalk Circle is playing until November 17, 2018 at the Young Centre for the Performing Arts (50 Tank House Lane, The Distillery). Shows run Tuesday through Saturday at 7:30pm, with 1:30pm matinees on Nov 10, 14 and 17. Tickets are Adults $25, Seniors $20 and Students $10. Image of the company by Cylla von Tiedemann.